To ensure you experience the high quality our Soy Candles offer we have listed below a series of common soy candle questions and answers. We encourage you to incorporate these techniques when enjoying Pure Integrity Soy Candles with family and loved ones. Do you have a question? Please submit your question below. Why is it important to trim the wicks? Trimming the wicks is very important. Trimming the wicks will keep the candle burning without any black soot and it will give your candle a longer burn time. Here is what happens when you do not trim the wicks properly. When a wick gets too long it cannot draw wax all the way up to the top of the wick. Therefore, the wick itself will start to burn. Even with Pure Integrity 100% cotton wicks and petro-soot free Soy Wax, you will see some soot if your wicks start burning themselves. So keep those wicks properly trimmed and your candle will burn petro-soot free!! Read more about soot vs petro-soot by reading our article on soot and candles. Why Am I seeing Soot On My Jar? You can read more in depth about soot vs petro-soot by reading our article on soot and candle. Soy wax burns clean with no petro-carbon soot which is found in paraffin wax (a petroleum byproduct). Petro-soot is harmful and contains many toxins and again is only found in petroleum products. A small amount of soot is a normal by-product of burning, whether you are cooking on the stove, burning a fire, or a candle. It is not toxic. You can dramatically diminish the amount of soot given off by keeping the wicks trimmed short. In fact, you can diminish it so much that you won’t even see it. Interestingly enough, if you keep the wicks trimmed on a paraffin candle you will always see black soot on the jars and in your house because again this is petro-carbon soot. So in short, if you are seeing soot on your jars you are not keeping your wicks trimmed short enough. How should I trim the wicks & how often? The wicks should be trimmed to a 1/4 inch every time before you light your candle. You can use a scissors, nail clipper, or candle wick cutters. Your best option is to use a candle wick cutter called the Candle Quencher. IMPORTANT: You should not allow your candle to burn more than a couple of hours at a time without trimming the wicks for the reasons stated in the previous question. If you want to burn it longer you should extinguish the candle, then trim the wicks carefully and relight it. This will give you extra hours of clean burning. Why do must candles have a hole burning down the center of the jar? Many candles have a hole down the center because they are using the wrong type and size wick. With Pure Integrity Soy Candles, we have tested hundreds of wicks to assure the proper fit giving the best burn possible. The proper size and type wick will be able to create a large enough melt pool that extends all the way out to the outer edge. That means no wasted wax around the edges but a beautiful even burn all the way to the very bottom. My home is a very open floor plan. Will one candle suffice? It seems each open floor plan house has different results. Some get great results with 1 candle, some need 2 or 3 candles. Understand it is more difficult to fill open floor plan homes since the scent has to continue to travel and as the scent spreads over large areas it will get less intense. An average room with walls will keep the scent inside and of course create a more intense strong scent. 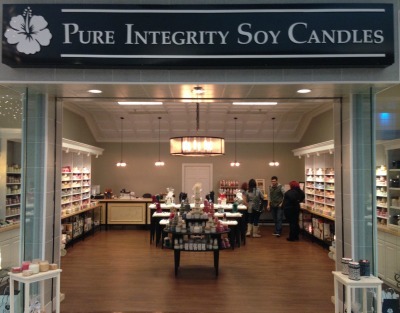 How does Pure Integrity Soy Candles come up with its burn times? Most candle companies give you the maximum time their candles will burn in an “ideal setting”. The candles are tested in a “test box”. The test box creates a perfect environment for the candles to burn in. It protects the candle from drafts, allows just the right amount of oxygen in, and often the candle is refrigerated to give it the maximum burn time. Obviously, this testing process is very unrealistic unless you plan to burn your candles in the refrigerator? 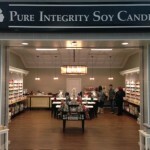 When we started Pure Integrity Soy Candles we made a commitment to honesty and integrity. Our burn times are based on test burning in a “normal living environment”. We test all of our candles in our living room, our kitchen, or our bedrooms. We burn them for about 1 to 2 hours at a time and we always trim the wicks before lighting again. 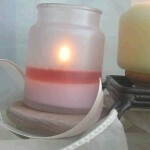 How can I get the most burn time out of Pure Integrity Soy Candles? In order to get the maximum burn time our candles offer, you need to be diligent in maintaining the wicks at 1/4 inch. Also, when burning the candle you have to burn it long enough to allow the melt pool to extend all the way out to the outer edge of the candle so you utilize all the wax. Why are the majority of candles on the market harmful? There are several unhealthy aspects in the majority of candles on the market today. First, most candles are made from paraffin wax or a combination of soy and paraffin wax. Paraffin wax is a petroleum by-product. It is refined gasoline. According to the Environmental Protection Agency, paraffin wax is harmful when burned and contains toxins – two that are considered above the excess cancer risk with multiple exposures. This is why we use a 100% soy wax formulation for Pure Integrity Soy Candles. Another is the use of wicks with any type of metal in the core, namely zinc or tin. When these wicks are burned the metal inside is actually burning, emitting harmful toxins into the air. 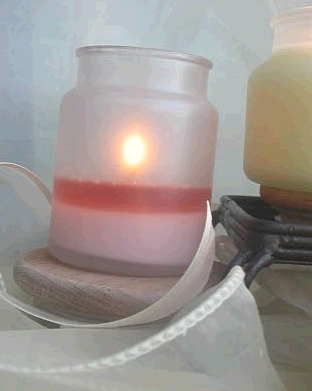 In Pure Integrity Soy Candles you will find 100% cotton core wicks! Another unhealthy aspect of candles can be the use of fragrances. Most commercially manufactured fragrances are formulated in a petroleum oil base, which has toxic properties when burned, and it also takes away from the purity and potency of the fragrance. In Pure Integrity Soy Candles we use our exclusive fragrances, which are made in a soy bean oil base as opposed to petroleum oil. What Is BHT? Is it in your candles? BHT is Butylated hydroxytoluene, also known as butylhydroxytoluene. It is a lipophilic (fat-soluble) organic compound that is primarily used as an antioxidant food additive, as well as an antioxidant additive in cosmetics, pharmaceuticals, jet fuels, rubber, petroleum products, electrical transformer oil, and embalming fluid. It is arguably carcinogenic. In the 1970s, Benjamin Feingold, a San Francisco MD who established the Feingold Diet, claimed that BHT could produce hyperactivity in some children. In addition, some controversy surrounds the link of BHT to cancer risk, some studies showing the potential to increase and some showing a decrease in risk. A lot of food industries have voluntarily eliminated this additive from their products, and since the 1970s it has been steadily replaced with the less studied BHA. We do not use BHT or any snythetic candle additives in our soy candles. BHT, or butylated hydroxytoluene, is an antioxidant that is used to extend the shelf life of foods. BHT is also used as a additive in some candles. Organic compounds in candles tend to react with oxygen, which can cause the base color of the wax to change, as well as react with combinations of fragrances and dyes, making it hard to create a great performing candle. When you pour and blend your wax formulation, you are introducing oxygen, which can cause the color of the finished candle to change over time and affect your fragrances. BHT binds with the oxygen molecules trapped inside the candle so that other organic compounds do not mix with each other, which reduces the effects of oxygenation and color shift in candles. How do I know If my candle is Soy? The majority of candles today are made with paraffin wax, a petroleum by-product or a combination of both. 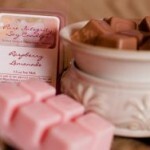 We use 100% soy wax, no fillers or partial blends of other waxes! The label on the bottom of the candle should say 100% Soy Wax. If it does not say that it is most likely a paraffin candle. But, keep in mind the candle industry is not regulated by the government so there are candle companies who will claim it’s 100% soy wax and it is really not. You must trust your source. A great way to tell is by its outward appearance. Soy wax tends to look creamy and soft, sometimes with subtle white discolorations and unique natural markings on the surface of the candle. Paraffin wax has a transparent texture, sometimes with dark discolorations and bubbles or craters on the top. Can I use a Candle Warmer With Your Candles? Do Pure Integrity Soy Candles Fade? Some of them do, yes. In order to keep the ingredients of our candles as natural as possible. Pure Integrity has chosen to not use ultra-violet inhibitors. Therefore, some of the colors will fade over time. We recommend that customers keep candles in a cool and dry place when not in use. Most fading occurs when candles are exposed to direct sunlight. 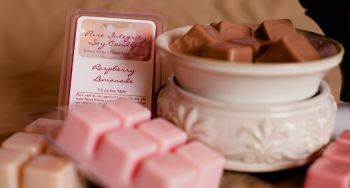 Why do Pure Integrity Soy Candles smell so incredible? Pure Integrity candles smell so incredible because of our innovative fragrance technology and our 7 step pouring process . Our 7 step pouring process allows us to get a substantially greater amount of scent to absorb into our unique soy wax formulation. To be specific, Pure Integrity Soy Candles uses 50% more fragrance than any other candle today! Wow you can smell the difference. Our exclusive fragrances are specifically created for our soy wax formulation. They are soy based as opposed to the majority of fragrances which are petroleum based. Our fragrances are so strong and smell so realistic you just won’t believe it! They smell sooooooo good. Read More Candle Questions & Answers . . . I adore the baby shower candles. Is it possible to create custom themes other than the ones posted? Thank you. Is the wax used derived from non-gmo soy beans? Do you sell candles wholesale?